Apple would love us to believe it's all "Eureka." But Apple produces 10 pixel-perfect prototypes for each feature. They compete — and are winnowed down to three, then one, resulting in a highly evolved winner. Because Apple knows the more you compete inside, the less you'll have to compete outside. We are all mesmerized by Apple's beautiful design, from device to screen, to the packaging itself. We see what the magicians want us to see. What we don't see is the 18 months of negotiating with the music companies. Nor the three years of teaching the supply chain that the Macbook Air had to be really thin, really light, and really enduring (10-hour battery). When those improvements intersected with the iPhone's great screen technology, the iPad (that glorious Air/iPhone hybrid) exploded. I wonder if the company is also trying to appease the Taiwanese factories that were stuck with parts of perhaps another 100,000 TouchPads, according to a DigiTimes story. It said HP was going to honor its commitments to its Taiwanese partners, who also manufacture its computers. The DigiTimes story said the parts were for a 7-inch model of the TouchPad that wasn't released before HP scuttled the line. It reminds me of the way Verizon reintroduced Microsoft's short-lived Kin phones last fall, before they all ended up at the Dollar Store. Pressing its case that the desktop is moving away from the center of computing, VMware Chief Technology Officer Steve Herrod gave attendees at the annual VMworld conference here today a glimpse at a technology the company is developing that will let workers access Windows applications regardless of the type of device they're using or the operating system it runs. Herrod built on the post-PC era theme VMware's Chief Executive Paul Maritz laid out in his keynote address at the conference yesterday. Herrod showed off technology from VMware's labs, some of which is being released today, that lets corporate tech managers simply provision applications--such as Microsoft's Excel spreadsheet software--to employees to use on iPads,Android phones, as well as their Windows desktops. If Google refines this extension to support both Blogger and Google+, it could become a Windows Live Writer competitor. We now have a solution for you: the +1 extension for Chrome! Once you install the extension, you’ll be able to +1 any page you visit on the web! It doesn’t yet have the ability to share to Google+, but we’ll automatically update it over time after you install it. So be on the lookout for new +1-tastic features in the future. The amount of time U.S. users spend on Google Inc.’s new social network has grown more slowly in recent weeks, according to Experian Hitwise, indicating that the service may struggle to make headway against Facebook Inc.
Users on average spent 5 minutes and 47 seconds on Google+ during the week ended Aug. 27, up about 4 percent from the previous week, according to Experian Hitwise, which tracks Internet statistics. Time spent on the site peaked in the week of July 16, at 5 minutes, 50 seconds, Hitwise said. Third is Chatter Connect, which is intended to entice software developers to work Chatter into other other enterprise applications which many people think are where the real action is in the social enterprise field. Ask the soon-to-be-public Jive Software, which can add social features to, among other applications, Microsoft Office. There’s also Yammer, which grabs social feeds from any application that has them, including, uh, Chatter. It’s not the newest idea under the sun, but Salesforce is off to a respectable start: Its first conquest is Microsoft’s collaboration software Sharepoint. Barnes & Noble Inc., the largest US bookstore chain, rose the most in more than three months after posting a smaller quarterly loss and projecting revenue for its Nook e-reader to more than double this year. The net loss narrowed to $56.6 million, or 99 cents a share. Barnes & Noble has sacrificed profits to invest in transitioning into a digital-content provider through its Nook e-readers. We’re excited to announce a new way for readers to connect with authors and engage in the community around their favorite authors’ books. @author lets readers ask questions while they’re reading a Kindle book, or from an Amazon Author Page. You can see below which authors are participating in our beta release. To ask one of these authors a question from a Kindle book, just highlight a passage using the 5-way controller, type “@author” followed by your question, and Share. We’ll tweet the question to the author and post it on the Author Page; you’ll automatically receive an email if the author answers your question. The first database supported by VMware is PostgreSQL, though McJannet said that other databases would be added over time. As to why VMware is supporting PostgreSQL first, McJannet noted that it's an open source technology with a long history of mission critical customer adoption. "We really do believe that PostgreSQL with its vibrant community and heritage of critical usage is a very good database for this purpose," McJannet said. From a competitive perspective, VMware is also stressing how the new vFabric Data Connector is different than simply using the Amazon RDS (Relational Database Service). "The real distinction between us and Amazon is that our service is about enabling database-as-a-service for the enterprise," McJannet said. "This is something that the enterprises can create on its own for internal uses." The problem is that in the real world of business, pricing has to bear some relationship to cost. No one is going to beat the iPad by building a product of equal performance and quality for less. Apple has mastered the supply chain and, with sales of the iPad in the area of a million units a week, achieves considerable economies of scale. It’s in the rare and wonderful position of offering a premium product while actually enjoying a cost advantage over competitors. That means that no one can hope to compete with Apple simply by offering a product similar to the iPad for less. If Apple were to perceive it as a threat, they could underprice the interloper while feeling less pain than the competition. It’s a game that only Apple can win. His question was, how smart was the decision by the government of President Hosni Mubarak to completely shut down the Internet and cellphone service on Jan. 28, in the middle of the crucial protests in Tahrir Square? His conclusion was, not so smart, but not for the reasons you might think. “Full connectivity in a social network sometimes can hinder collective action,” he writes. To put it another way, all the Twitter posting, texting and Facebook wall-posting is great for organizing and spreading a message of protest, but it can also spread a message of caution, delay, confusion or, I don’t have time for all this politics, did you see what Lady Gaga is wearing? The idea of a post-PC era runs counter to the vision Microsoft likes to promulgate. Earlier this month, Microsoft PR boss Frank Show sought to debunk the post-PC era meme, blogging that "PC plus" would be a better term. Maritz, though, noted that personal computing era was largely about automating white-collar work. Increasingly, though, workers are using computers differently. They're connecting via social networks and collaborating using Internet applications. "The problem is that people under 35 don't sit behind desks. They don't lovingly create documents," Maritz said. "We're moving to a post-document era." Austrian blogger and developer Florian Rohrweck recently discovered a lot of Google+’s upcoming features just by digging around in the source code for the new social networking service. He was one of the first (but not the only one), to reveal Google+ Games before its launch, for example, as well as still unreleased features like “Shared Circles” and social search, among other things. Now, it seems, Google has had enough of Rohrweck’s snooping. It’s hiring Rohrweck to help secure the code instead. Late last week, I discussed Microsoft's revelations about the changes to Windows Explorer in Windows 8, noting that Rafael Rivera and I had previously and exclusively revealed that Explorer would include the ribbon UI that's also used in Office 2010 and Windows 7's Paint, WordPad applications, as well as several Windows Live Essentials applications. In that original look at Explorer, I noted that Microsoft has minimized the ribbon in its Explorer screen shots and the accompanying video, so there wasn't much to see beyond the existence of a Quick Access Toolbar. But this week, Microsoft opened the Explorer kimono a bit more and showed off the final design of the ribbon UI in Windows 8's Explorer. Collaboration is one of Cisco's five company priorities and represents what Cisco believes to be a total addressable market of $45 billion. The acquisition will provide more opportunity for Cisco partners to provide enhanced collaboration solutions to customers. Versly's software will be integrated into a variety of Cisco's collaboration offerings including Cisco Quad, Cisco Jabber and Cisco WebEx. For example, users will be able to receive automatic notifications within Cisco Quad when the content of a document has changed, escalate from simply reviewing a document to an instant messaging session through Cisco Jabber, or initiate a web conferencing session from a presentation through Cisco WebEx. "With this acquisition we are gaining strong talent and innovative technology that builds on Cisco's successful collaboration platform," said Ned Hooper, Senior Vice President and Chief Strategy Officer, Cisco. "We continue to expand our collaboration architecture to change the way businesses work." While some may view a partnership with Google as an asset, we see it as a challenge. Product strategists that we’ve spoken with at OEMs have voiced frustration about the limits of Android — its lack of polish, the terrible shopping experience in the Android Market, the rules that Google has set for Honeycomb use that limit differentiation, and the fragmentation of earlier versions of the OS. Only 9% of consumers considering buying a tablet actively prefer an Android tablet — compared with 16% who prefer iOS and 46% who prefer Windows. Barnes & Noble has chosen to emphasize its own brand and user experience on the Nook Color rather than emphasize the Google or Android brands, even though the Nook is built on Android. Amazon may not wish to go that far on the curation spectrum, but it does need to differentiate its flavor of Android from all the rest, and that may come from emphasizing the Amazon experience over the Google one. PC clone makers can’t match Apple’s cost or its Bill Of Materials (BOM). The way Apple procures parts and subsystems, the way it runs contract manufacturing and stays on top of complicated but delicate distribution logistics is evidence of the company’s aggressive Supply-Chain Management (SCM). Steve – and thus Apple – understands that the channels need to be fed Just So, neither starved nor stuffed. A nice MacBook Air competitor starting at $1969. The real thing starts at $1299. Quite a reversal of the old world order and, I hope, a source of satisfaction for Jobs. Before Google+, your Google identity was really only used on Google sites. But with Google+ and the +1 button, that identity system can extend across the Web -- if you're signed in to Google+ and you +1 a particular Web site, that information can be tracked. That helps Google provide more personalized services (like search results) for you, but could also help with ad targeting. Schmidt also said that Google believes the Internet will work better if people know that you're a real person rather than a fake person or a dog. Andy Carvin asked the question, then paraphrased Schimdt's [sic] answer on -- of course -- a Google+ post. Google+ Isn't Just A Social Network, It's An "Identity Service"
When Hewlett-Packard launched the TouchPad in July, the company had high hopes for its future. It thought that WebOS could catch on with customers, and consumers would respond well to the device’s iPad-like design. But in less than two months, it became clear that wasn’t the case. HP was forced to discontinue the device. Some have criticized HP for discontinuing its tablet so soon. They say that the company should have stuck it out to see if things would turn around. They also suggested that the company should consider offering up a new version of its tablet to try to appeal to those looking for something else. But HP disagreed. And instead, the company decided to end its tablet program altogether. Looking around the tablet space, it’s now clear that other devices might soon follow the TouchPad. Aside from the iPad 2 and the Samsung Galaxy Tab 10.1, there isn’t a single device that is performing all that well at retail. It’s about time these tablet makers do something about that. To help them out, we’ve compiled the following list to highlight 10 tablets that are on their way toward joining the TouchPad on the extinction list. But like many young technology companies that experience early success, it has a problem. Its fortunes are based on a single, highly successful product – in this case something called “virtualisation”, which greatly increases the utilisation rates of corporate servers. Microsoft, smelling blood, is now giving the same software away free of charge to Windows users – a tactic it has used to crush rivals in the past. Like many software executives before him, that has Mr Maritz racing for his life as he tries to turn VMware into a broader supplier of software for the new world of “cloud” computing. “That won’t carry us forever,” he says of his company’s main cash cow. As is usual in the excitement of breaking news events, Twitter became home to a lot of misinformation too. An awe-inspiring photo of “Hurricane Irene approaching North Carolina” began circulating social networks early Saturday evening and was quickly shared by thousands of people. 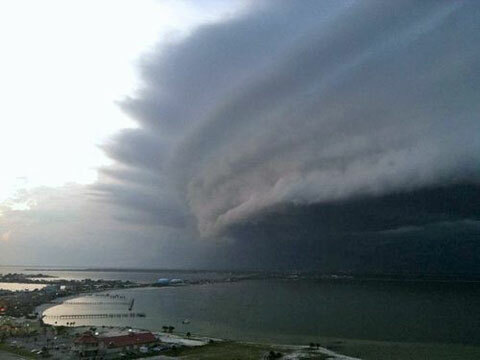 The only problem: the image was actually taken weeks ago in Pensacola, Fla., and had nothing to do with Irene. Still, the photo was viewed 270,000 times on TwitPic, a Twitter image Web site. For Apple’s part, until it can find a way to become a prime delivery channel for content, it is unlikely to go beyond the “hobby” of Apple TV. While I can’t see Apple ever getting into the no-margin TV display business, I have no doubt that it could build a set-top box vastly better than the lame Motorola and Cisco products offered by the cable companies and vastly better than TiVo or Google. The problem is that access to the content runs through the cable companies, and I cannot imagine Apple trying to build such a product based on the kludgy CableCARD or its vaporous successor, tru2way. Apple won’t do it until it can do it right, and that will require the cooperation of a very reluctant entertainment industry. It may happen–Apple, for one thing, has a whole lot of money to throw around– but it won’t be easy. Amazon has already shown that it can beat both Apple and Google to the punch by offering to store customers’ music collections in "lockers" in the cloud. Users can then access their tunes from any computer or Android device while on the move. Amazon’s “Cloud Drive” provides users with five gigabytes of storage for free. All together, that sounds like a pretty nifty way of building an Amazon-based ecosystem—and locking customers into it. Steve Jobs, Apple's charismatic former boss and architect of its remarkable self-supporting ecosystem, should be more than a little concerned. Schmidt told the Edinburgh television festival its lack of success so far was partly because it was a feature designed into televisions, devices which consumers tend to replace only about once every five years. "We're absolutely committed to staying, to improving Google TV," he said, adding that new companies would be joining existing partners Sony and Logitech for the next version. Logitech makes computer mice, speakers, webcams and keyboards. "I believe that they're both going to be on board and I believe there are many more coming. Wait shortly for an announcement," he said. Apple is almost certainly working on a digital television based on its iOS operating system, according to multiple sources in Silicon Valley. An Apple-based television makes sense in light of Apple’s continued expansion out of the computer industry into the larger consumer electronics market. But is it real? As part of a dramatic effort to expand its IT offerings to a global audience, Stanford University will be offering three popular 101-level courses free online as part of a global virtual classroom. The offerings include “Introduction to Artificial Intelligence,” “Introduction to Databases” and “Introduction to Machine Learning,” all to be delivered between October and December. Study groups have been formed at reddit. The “Introduction to Databases” course covers database design and the use of database management systems for applications. It includes extensive coverage of the relational model as well as NoSQL (Not Only SQL) databases. It also covers XML data including DTDs and XML Schema for validation, and the query and transformation languages XPath, XQuery, and XSLT. The course includes database design in UML, and relational design principles based on dependencies and normal forms. Course material is posted here. Skype has launched an app store, or as it's calling it, an app directory, with a list of third-party apps that were built on Skype's platform. Online intelligence firm Experian Hitwise is reporting that Groupon’s weekly U.S. traffic rates have dropped off by almost 50 percent last week since its peak during the second week of June 2011. Although Hitwise acknowledges that figure represents only web-based traffic but not include mobile or apps traffic. 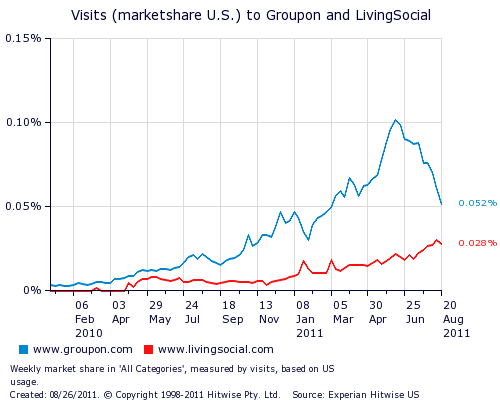 However, based on the same rules above (web-based only in the U.S.), domestic visits to Groupon’s chief competitor LivingSocial has surged by 27 percent. Social networks have crossed another milestone. For the first time, half of all adults in the United States said they use a social networking site, according to a survey released Friday by the Pew Research Center. That’s 50 percent of all Americans, not just those who say they are online. Six years ago, when Pew first conducted a similar survey, only 5 percent of all adults said they used social sites, like Facebook, LinkedIn or MySpace. After testing Deals for four months, we’ve decided to end our Deals product in the coming weeks. We think there is a lot of power in a social approach to driving people into local businesses. We’ve learned a lot from our test and we’ll continue to evaluate how to best serve local businesses. During this emergency, The New York Times is providing unlimited free access to storm coverage on nytimes.com and its mobile apps. How did Jobs steer the company away from its crash course with the graveyard? By introducing an unrivaled string of hit products. Benioff says the social media push will help Salesforce nearly quintuple annual sales, to $10 billion, though he sets no date for that goal. Wall Street is optimistic. Today the stock is trading at 821 times last year’s earnings, 6.6 times the tech industry average, according to Bloomberg data. This despite the fact that Salesforce earned just $43.1 million in the second quarter—and actually suffered a small loss if options and other expenses are included. Next quarter, analysts expect the company to lose $6.5 million, in part because of hiring and acquisition expenses. In May, Salesforce paid $340 million for Radian6, which makes software to monitor social media conversations (and is now a part of the Winter ’12 offering). Meanwhile, early social media initiatives aren’t exactly raking in big bucks. Salesforce had to cut the price of the first iteration of Chatter from $50 to $15 per user per month, says Benioff. “The bear story is they’re spending money somewhat like drunken sailors,” says Brent Thill, an analyst at UBS (UBS) who nonetheless rates Salesforce a “buy,” in part because of the social media efforts. Facebook said it already took down threats of violence and other offending material and was working on speeding the process. “We look forward to meeting with the home secretary to explain the measures we have been taking to ensure that Facebook is a safe and positive platform for people in the UK at this challenging time,’’ the company said in a statement. And now we have Jobs’ resignation. But he’s not going away, not signing-up for Apple COBRA benefits, just giving up to Cook his duties as CEO. Jobs will remain an Apple employee and chairman of the board. That makes him what’s called an executive chairman — one who is on the job every day. And that job he’ll be doing every day is overseeing Tim Cook’s execution of the corporate strategy designed by Steve Jobs. This looks to me like Cook continuing to function in his Chief Operating Officer role. Oh he’ll get a big raise and an even bigger bonus, but my sense is that next week the guy really in charge will still be Steve Jobs. And the Apple board, satisfied that the succession question has been answered and their own fiduciary asses are covered (I suspect this is a big part of it) can go back to sleep. But it isn’t a long-term solution. 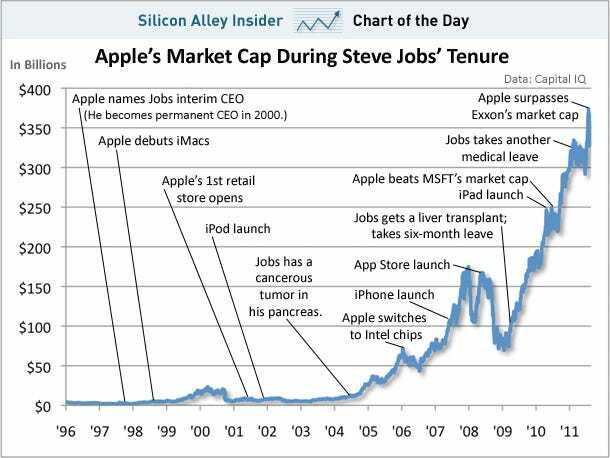 Steve Jobs won’t be around forever and a true successor will have to be chosen eventually. For all his administrative skills, Cook can’t fill Jobs’ visionary shoes, so I’d look for another leadership change, maybe tied to the release of Isaacson’s book. It’s sad to see RIM struggle for a future. Yes, the company has made some gigantic mistakes: it sat smugly on its business phones for far too long, ignoring the public’s obvious love of touch, multimedia and beautiful design. It spent too much time and diverted too many resources trying to come up with its disastrous PlayBook tablet. So, this is not an obituary. But his health is reported to be up and down, and even an active chairman isn’t the same as a CEO. CEOs resign every day, so why is this departure so meaningful? Facebook hit a new milestone in June this year - the site touched a trillion page views from the 870 million* people who visited Facebook that month. Check this infographic to get an idea of how big a trillion – or a million million – is. [*] Officially, Facebook has 750+ million users but the number of unique visitors who flock Facebook every month is much higher because certain section of the site – Facebook Pages and Profiles for example – are open to non-users as well. Google has bought 12 patents relating to “cross-referencing information online, techniques for speeding up Web browsing and online advertising” from Northbrook Digital LLC for an undisclosed sum, the Minneapolis Star Tribune reported. Google has confirmed the deal, which was announced Monday by Northbrook’s owner Mark Wolfe, and was executed July 21, according to a U.S. Patent and Trademark Office filing. Amazon.com appears poised to throw down the gauntlet in the fast-growing market for movies and TV shows streamed over the Internet. A new report says the Seattle company is expected to bid for Hulu, a privately owned video website that makes money by selling ads and subscriptions for online access to popular TV shows such as "Glee" and "30 Rock." BlackBerry e-mail messages were delivered as usual after an earthquake struck Virginia today while calls failed, a potential boon to manufacturer Research In Motion Ltd. as it tries to win back lost market share. Ticketmaster, the event ticketing property of Live Nation, is enhancing its interactive seat maps Tuesday so that ticket buyers and event-goers can see where their Facebook friends are sitting, and tag themselves into their seats. With the upgrade, Facebook members can now connect their accounts to view a Facebook-infused event seat map that highlights where friends at sitting with miniature Facebook flags. “There’s a level of desperation from anyone whose name is not Apple,” said Mr. Hilwa. In a brief opposing Apple’s motion for a preliminary injunction in the United States, Samsung argues that one of the iPad design patents at issue in the case is predated by a prop used in Kubrick’s 1968 film. Drunken revelers rejoice: Facebook will now let you decide whether your friends can attach your name to a photo before it is circulated. Currently, your friends can add your name to a photo on Facebook without your consent or knowledge. You can remove it later, but only after lots of others may have seen the embarrassing shots. Now, you can insist on preapproval. Fiduciary Trust’s Mullaney says Hewlett-Packard, which has lost almost half its value since Hurd left a year ago, must consider all options to help shareholders recoup their money. This idea stems from a New York Post story Sunday, which asserts that the sell-off in the stock last week has “put the world’s largest tech company in a vulnerable position and may make it an Oracle takeover target.” The piece says that “one source close to the situation” thinks Ellison is ready to pounce, and that a deal is “inevitable” if HP’s share price keeps dropping. As for those who bought TouchPad devices prior to the fire sale that started this weekend, DeWitt says that they will be taken care of, with more details to come from retailers and HP. DeWitt acknowledged that HP could have done a better job of communicating its plans. In other words, webOS may look mortally wounded, but HP insists it’s just a flesh wound. “… price the TouchPad better” as in probably losing hundreds of dollars per unit? Gee, why didn’t HP think of that approach sooner? But just after HP announced plans to put WebOS out of its misery, discontinuing operations for devices running on it, the operating system has shown a new luster. TouchPads are flying off the shelves at fire sale prices and WebOS application developers are the subjects of at least one company's hot pursuit. It almost seems as if HP, had it been able to price the TouchPad better and harness the enthusiasm of its developers, could have turned WebOS into a contender. Best Buy has resumed sales of the HP TouchPad after getting the message loud and clear that consumers believe the price is right, even if the tablet has been discontinued and its operating system is uncertain. Over the weekend, HP marked down the 16GB version to $99 and the 32 GB version to $149, representing a price cut of $300 or more. More trouble ahead for Books & Nooks? Barnes & Noble Inc. shares plunged 17.5% Friday, after a takeover offer fell apart, leaving the bookseller without a deep-pocketed parent in its battle against Internet giants Apple Inc. and Amazon.com Inc.
Barnes & Noble said on Thursday that its recent suitor, John Malone's Liberty Media Corp., had ended discussions of its $17-a-share bid. But while Motorola may have pushed for the high fee in exchange, the company must put up with a lot in the meantime. The acquisition agreement sharply regulates how Motorola can run its business in ways beyond normal deal terms. The other observation that is no joke: Apple is the only maker with strong PC growth. Spending on desktops and laptops grew 16 percent in the latest quarter, while Dell’s consumer product sales increased 1 percent. But, until a few days ago, several sources close to the situation said, Bradley knew nothing of these plans and neither did webOS’s key driver of late, former Palm CEO Jon Rubinstein. This surprising lack of disclosure by HP to two of its key execs begs the question: Will they stay or will they go now? According to sources, staying put is the plan for both for now, although it depends on what such a spinoff will look like. But if there is anything that can catch a little consumer attention, it's a price cut. And the HP TouchPad is receiving what is possibly one of the most dramatic price cuts in all of tablet computer history -- down to $99.99 in Canada. Well, not all of Canada, but the $100 TouchPad, with 16 gigabytes of memory and Wi-Fi only, is available in our neighbor to the north's Best Buy and Future Shop stores (Future Shop is a retail chain owned by Best Buy). The 32-gigabyte model of the TouchPad is selling in either store for $149.99. There are reasons for the self-congratulation though. Lenovo pushed up PC shipments more than 23 per cent during the quarter as the global market moved up 2.7 per cent – the ninth consecutive quarter it outgrew the market. Big Blue last week celebrated the 30-year anniversary of the PC but one of its engineers behind the original design reckoned systems have seen their best days and are "going the way of the vacuum tube, typewriter, vinyl record..."
Chuanzhi disagrees: "Our results show that Lenovo's acquisition of the IBM PC business has become a success. In future quarters, you will see clearly that we will take what we've learned from this acquisition and apply that knowledge towards our joint venture with NEC in Japan and our acquisition of Medion in Germany." Messenger lets groups of Facebook users communicate with one another in the moment even if they're using different communication technologies—for example, with one person using instant messaging, another text, and a third e-mail. Messenger taps into Facebook's vast supply of data about contacts and connections, including users' e-mail addresses, instant-message handles, and phone numbers. Facebook already offers a feature called Groups, which lets people communicate over time about specific topics of interest, and one called Events, which lets them plan social occasions. But these aren't much good when groups want to communicate on the spur of the moment. "Until recently, you couldn't do it in real time," says Lucy Zhang, one of the engineers who built Messenger. Zhang is a cofounder of Beluga, a startup that created group-messaging tools and that was acquired by Facebook in March. Beluga's technology became the core of Messenger. Autonomy's products enable companies to do things like analyze transcripts from call centers; discover which sales strategies work best; and process troves of emails and other documents to match what is being said and done against a company's legal responsibilities. Such analysis can be automated using software that looks for certain things automatically, or performed manually by a person entering queries, and then sifting through the results themselves. Andrews says business and technology companies are beginning to realize that both types of analysis could offer much more than conventional approaches, which rely on so-called "structured" data--such as a spreadsheet organized into labelled columns. "Business analytics is about structured data, like spreadsheets," says Andrews, "Autonomy does an exceptional job at analyzing unstructured data, which may prove even more valuable." From the executive suite, HP's move may look decisive and maybe it will pay off in the long term. But from a distance it looks like more wild directional changes at a storied company that has lurched back and forth in search of a strategy under a series of challenged chief executives. The only thing consistent about HP lately is its apparent hatred of Microsoft. One slight hitch in the survey is that there appears to be no consensus on the definition of "big data." According to Revolution Analytics, some data scientists consider the "big data" threshold to be a terabyte, some say it's a petabyte, and some consider "big data" to be "just above what can be reasonably managed for any given job." Now that's a flexible definition. Hewlett-Packard announced Thursday plans to spend some $10.25 billion in cash to acquire Autonomy, the United Kingdom-based software and services company. Given that HP’s cash reserves currently total $12.9 billion, the deal represents a major monetary outlay that will leave the company’s wallet significantly lighter than it has been for many years. Why is HP is taking such a huge leap? HP made the announcement that it was ceasing to make webOS hardware, but neglected to get a hardware licensing deal in place before doing so. This seemed to drive home the point that webOS was dead in the water, when in fact it is very much alive and was never the issue. It was the hardware that was killing HP’s OS. If HP had announced a licensing deal before the discontinuation of the hardware, the news would have gone much differently today. There would be no stories about the ‘death of webOS’, an OS that many of us thought was just starting to get good. Hearkening back to his two-decade career at SAP AG, Apotheker plans to spin off Hewlett Packard’s personal-computer business and dive deeper into business software with the $10.3 billion purchase of Autonomy Corp.
With the plans announced yesterday, Apotheker, 57, makes good on pledges to expand in cloud computing and aims to challenge Oracle and International Machines Corp. in more profitable products aimed at corporations. Business software delivered a 19 percent operating margin last quarter, more than triple the amount for the PC unit due to be jettisoned. When the TouchPad launched, and subsequently floundered out of the gate, Apotheker had what he needed. He landed Autonomy and it was set. HP wasn’t going to be the next Apple. They were going to be the next IBM. Not IBM, the PC juggernaut, mind you — IBM the company that cut loose the PC hardware division and focused on data and enterprise. That’s what so jarring about today’s news: HP just did a full stop and then a 180 before our very eyes. Apple and IBM both resurrected themselves in recent years, but each did it in opposite ways. The Apple plan didn’t work for HP, Apotheker decided. He now clearly believes the IBM plan will. Something else to consider: when HP bought Palm for $1.2 billion last year, the world was a different place. These days, companies are paying $4.5 billion for a group of patents. Google is paying $12.5 billion for Motorola, a large portion is which is also for patents. Along with Palm and webOS, HP got Palm’s 1,500+ patents last year, as they emphasized to us at the time of the sale. If those patents are as important in the mobile space as some believe, they alone could be worth more than the $1.2 billion Palm sale price now. If HP can flip those for north of that price, the whole acquisition won’t look like nearly as much of a disaster as it does right now. CFO Cathie Lesjak largely reiterated Apotheker’s dual message, but added some grim financial numbers to the mix, indicating that the webOS unit was the cause of hundreds of millions of dollars in losses and threatened to cause an even bigger loss next quarter had the company continued to move forward with its strategy. Not that long ago, of course, HP saw all kinds of options for the software, promising to put it on all manner of PCs and printers, not to mention tablets and phones. Just what HP is trying to do with webOS in terms of selling it or licensing it is not clear. Richard Kerris, the former Apple executive brought in by HP to head developer outreach efforts, held out hope a buyer might be found. Louis Gray was among the first people I met in my early blogging career. Indeed, he was probably the first blogger I exchanged emails with and the first to publish my full name while I was still writing semi-anonymously. Since then, he’s moved on to become one of the most recognizable faces in the social media space and, after quitting his original job as marketing director at BlueArc, launched a succesful consulting firm and joined recommendation engine my6sense as its VP of marketing. That’s not a bad career, but on Monday, Gray is leaving both my6sense and his consulting career behind to join Google and focus on product marketing and evangelism for the Google+ team. HP today commented on the recent announcement by Autonomy Corporation plc (LSE: AU.L). HP confirms that it is in discussions with Autonomy regarding a possible offer for the company. Big changes expected for HP, which appears to be bringing its IBM business model emulation strategy to full fruition (e.g., moving to services, dumping its PC business, and acquiring mature software companies). Probably time to update the PC 30th anniversary timeline HP recently co-sponsored. Hewlett-Packard Co., the world's biggest computer maker, is expected to announce a spinoff of its PC business and is close to a $10 billion deal to acquire U.K. software firm Autonomy Corp., said people familiar with the matter. H-P may announce its plans as early as Thursday, the people said. The company was expected to report its latest quarterly earnings after the U.S. markets close. What is needed is a truly patriotic position, one that would explain to voters, whatever their sympathies, that there is no American nation without an American middle class, and no American middle class without an American government that provides the essential services that allow people to move up in a globalized world. Whatever one thinks of the Tea Party’s Orwellian references to our revolutionary heritage, there’s no danger of a return to an eighteenth century when Ohio did not even exist, and the midwestern economy depended on the Indian flint arrowheads that today pass beneath the blades of the massive high-tech combines. The real danger is that we will move briskly forward to national non-existence, misunderstanding the plainest lessons of our own past along the way. By the time the costs of right-wing anarchism reach the truly privileged, it will be far too late for everyone else. If we don’t find a way to adapt own national thinking to global reality before then, all we can look forward to is leaving a trace: like fossils, or arrowheads, or the mammoth tusk that hangs on my grandmother’s porch. Whenever you're navigating to a new page, Google Related will look for interesting related content and, if available, display it in a bar at the bottom of your page. Google Related can display categories such as videos, news articles, maps, reviews, images, web sites and more. To preview a listed item or see additional items, just use your mouse to hover over different categories in the bar. For example, when you hover over a video link, the video pops up in a preview box and you can play the video directly on the page. The investigation into Standard & Poor's began before the company cut the United States’ triple-A credit rating this month. The BlackBerry Bold may be out of the smartphone game before it even gets into it. T-Mobile USA said today that it will sell RIM's latest flagship phone, the BlackBerry Bold 9900, for $299.99--after a $50 mail-in rebate. That follows the Verizon Wireless and Sprint Nextel variant of the smartphone, the Bold 9930, which will retail for $249.99 at both carriers. But when the bar for a vast majority of smartphones--even high-end ones such as Apple'siPhone--is set at $200, and you go over, that's a problem. GOOD, a fast-growing publishing and marketing business that promotes social causes, is acquiring Jumo, a social networking site that raises money and support for nonprofit groups. The deal may signal the beginning of a consolidation in the world of online intermediaries set up to help nonprofits, which have proliferated in the last few years. Opposition to regulation and skepticism about climate change have become tenets of Republican orthodoxy, but they are embraced with extraordinary intensity this year because of the faltering economy, high fuel prices, the Tea Party passion for smaller government and an activist Republican base that insists on strict adherence to the party’s central agenda. But while attacks on the E.P.A., climate-change science and environmental regulation more broadly are surefire applause lines with many Republican primary audiences, these views may prove a liability in the general election, pollsters and analysts say. The American people, by substantial majorities, are concerned about air and water pollution, and largely trust the E.P.A., national surveys say. For a private equity firm that’s looking for the cheapest way to get online, AOL Inc. is trading for 57 cents on the dollar. The Internet pioneer spun off from Time Warner Inc. in 2009 plunged to a record low last week after cutting this year’s profit forecast because of slowing growth in display advertising sales. With its market capitalization reduced to $1.3 billion from a peak of $3.1 billion last year, New York-based AOL is now the cheapest relative to its net assets of any U.S. Web company with a value of more than $500 million, according to data compiled by Bloomberg. With AOL trading at a 43 percent discount, the company may now attract private equity buyers that can still extract $1.5 billion in cash out of the access business within three years, according to B. Riley & Co. If it weren’t already pretty obvious that Jive Software had begun the long march toward an initial public offering, then there can be no doubt after today. Bloomberg News scored tips from three sources — my guess is chatty bankers — that Jive has tapped Morgan Stanley and Goldman Sachs to lead its IPO, with UBS and Citigroup also in on the deal. This larger, thinner version of the seven-inch tablet Samsung rushed to market last year is superior to the original in every way. 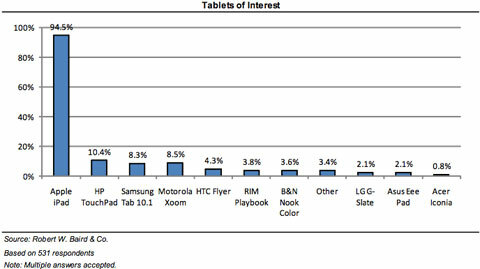 Indeed, if it had come quicker to the market, Samsung might now be neck and neck with Apple in tablet sales. The first really good Android tablet, the Xoom from Motorola Mobility Holdings Inc., looks and feels like a cinderblock next to the Galaxy Tab. Indeed, the Samsung tablet is slimmer and lighter than the newest iPad, with a textured plastic back that seems to welcome your fingers.